As someone who’s spent the past few weeks in the sultry heat of New Delhi, I can attest to the fact that the iPhone is not very fond of direct sunlight. Just the other day, I was using Google Maps on my first-generation iPhone to track my position and get directions to a Chevy service center when a call came in. The moment the phone made contact with my ear, I reflexively jerked it away—that’s how hot it had become. Perhaps after receiving several complaints from iPhone users living in areas with sweltering climates, Apple decided to make the iPhone 3G a little proactive in this department. 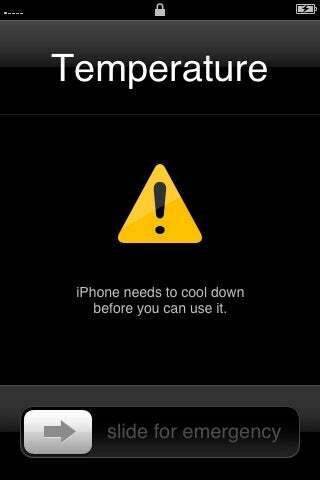 To prevent the iPhone from being used constantly in high temperature areas, which might lead to it not working at all, Apple has put in place measures that kick in when the phone starts becoming too hot for its own good. The iPhone 3G includes a temperature warning screen (detailed in an Apple support article) and once it appears, the iPhone can only be used for emergency calls and is otherwise completely disabled until it is allowed to cool down. Apple recommends turning it off and moving it to a cooler environment for a while before turning it on again. Luckily, many residents of places such as the U.S. and Canada will never see this screen at all. Although I laud the fact that Apple has put such a preventive measure in place, I dislike the modal nature of the implementation. I’m not convinced that it’s a good idea for my phone to suddenly stop working right in the middle of something just because it became too hot. I may have been doing something important at the time, after all, and need to be able to use my phone. Take, for instance, my situation described at the beginning of this article—if my iPhone had conked out on me due to the taxing heat during my drive, I would’ve faced major problems trying to navigate the unfamiliar and extremely busy streets of New Delhi on my own. Therefore, while I think that the warning is apt, it would be nice if the iPhone allowed the user to dismiss the warning and get back to what they were doing.